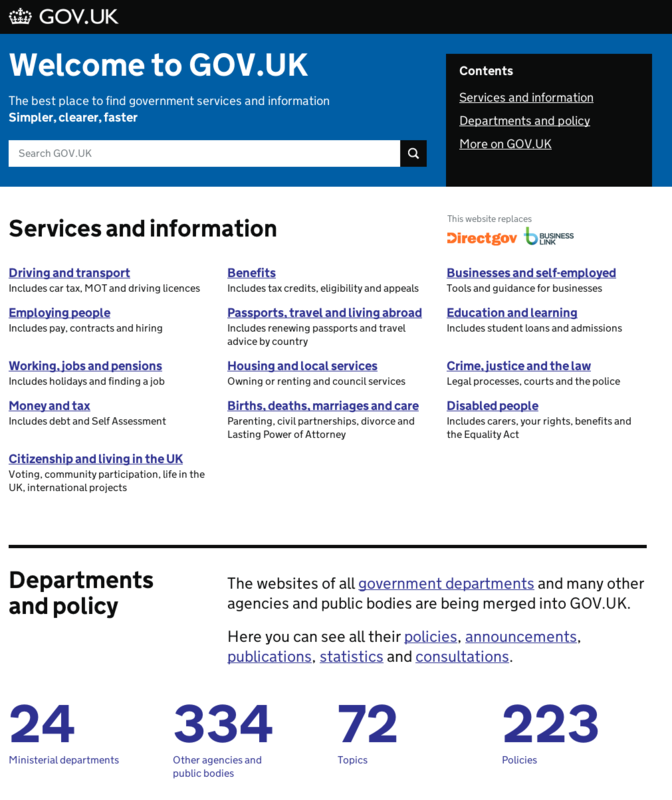 The GOV.UK homepage - how is it performing? As Stephen McCarthy explained in his post, this revision followed the move of many more organisations to GOV.UK. We wanted to help users find information from government departments more easily. We’ve also improved GOV.UK’s site search and so we’ve increased the prominence of the search box on the homepage. So how have these changes impacted on use of the homepage? We don’t have an issue with this. In fact we expected it to happen as GOV.UK became better indexed by search engines and as users become more familiar with the site. 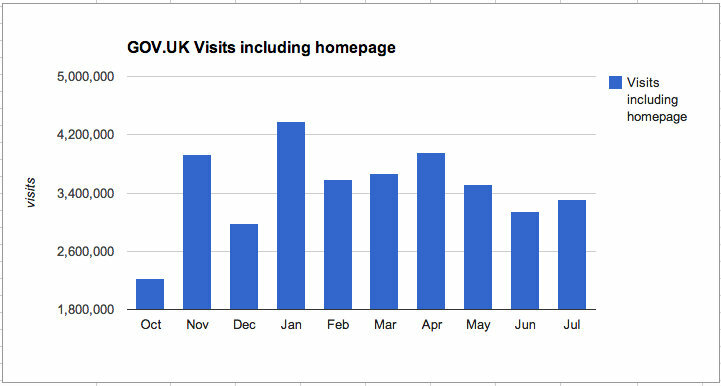 As the site’s overall traffic has grown, the actual number of visits to the homepage has remained more constant, with over 3.3 million visits in July. So it’s important that the GOV.UK homepage continues to work; getting people to the information they need via site search and navigation. Giving the search box more prominence has led to increased use of search from the homepage. Comparing the full week after the new homepage design release with the week before, saw 40% more searches from the homepage, with weekly searches rising from 82,000 to 115,000. What’s more, in the latter week, some 19% of visits to the homepage led to a site search from there, compared to 13% in the week before. The most significant design change is the new area in the middle of the page called ‘departments and policy’. Has this increased visibility led to more traffic? As discussed above, search has become more popular and the old link to the Inside Government page is no longer available. But, in general, the popular links to Services and information (i.e. Mainstream) dominate the top twenty. 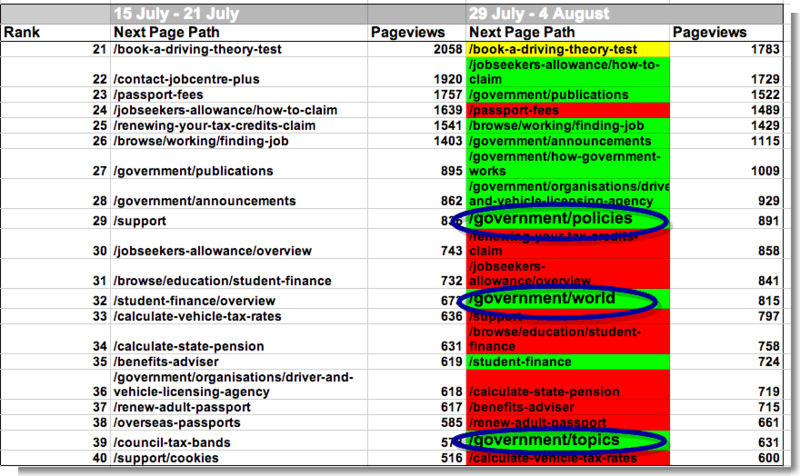 The Inside Government links promoted in the new Departments and policies box are now gaining more pageviews from the homepage, especially Policies, Worldwide and Topics. Of course, the number of visits to and from the homepage is impacted by many more variables than the design of the homepage, but on this first benchmark it looks like the redesign has been a success - leading to greater use of site search and more visits to important Inside Government sections. We’ll continue to monitor the overall visits trend to the homepage and the popularity of links from the page. And we will be using analytics data to help inform work on improving category navigation.